Description:A light refreshing grilled salmon dish with a tropical twist! A heavy bottom pot to fry in, a slotted spoon or strainer basket to use during frying, or if you have one an electric fryer and an oven set to 250 degrees F., 3 cups oil for frying, heated in a pot so the oil is 3 inches deep and heated to 325 degrees F. 1.) First make the vinaigrette: combine all ingredients except the olive oil in a bowl, or blender. If you're not using a blender, whisk in the oil as it's poured into the bowl in a slow steady stream. You may also use an immersion or stick handheld blender device. If using a blender, do the same, it will be faster and there is less chance of spilling. Pour finished dressing into a storage container and refrigerate. 2.) Second: ready your salmon, cut and trim, wash in cold water and pat dry if needed and place on a a clean plate. Cover with plastic wrap and refrigerate. Have oil and salt in small containers ready to go to the grill with the salmon when you are ready to cook it. 3.) Third is to ready the zucchini. Wash the squash and towel dry. Cut it into 3 inch lengths and then into 1/2 x 1/2 pieces. Mix the egg or substitute with water and set aside. Mix the flour with the salt and set aside. Ready the oil, a pot, a strainer basket and something to drain the fried zucchini on. Lightly toss the zucchini in flour, remove it and place it in the beaten egg and then drain it in a strainer. The coconut should be spread out on a baking pan. Transfer several pieces of zucchini at a time from the strainer to the coconut pan and roll them around to coat all sides. Place the coconut battered zucchini on a clean plate, repeat as needed and then refrigerate the entire plate of battered zucchini. 1.) Set your dinner table with whatever else you want to serve with this dish and ready your serving plates! 2.) Your grill should be turned on, the grill grates cleaned and the grill up to temperature. 3.) Your frying devices should be on and up to temperature with a drain plate and utensils ready. 4.) The vinaigrette should be taken from the refrigerator and shaken up and ready to ladle over the salmon. 5.) The salmon, oil and salt should now go to the grilling area. Fry the zucchini in 3-4 small batches until golden brown and drain on a paper lined plate and place in the 250 degree oven to keep warm. Brush the salmon filet on what was the bone side (the shiny side) with oil and sprinkle with salt. Place it on the grill with the oil-brushed side down, grill 2 minutes. Turn the the salmon with a spatula 90 degrees and place back down on the grill on the same side and grill 2 minutes. Turn the salmon completely over and grill 2 minutes for rare to medium rare or 4 minutes for medium-well. Place the salmon filets on serving plates with fried zucchini, dust the zucchini with powdered sugar and garnish the plate with lime wedges. 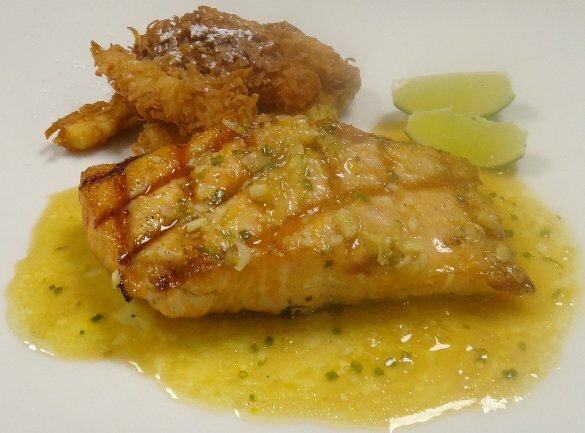 Spoon 2 ounces of the citrus lemongrass vinaigrette over each piece of salmon and serve--et voila--enjoy!